I first planned to do a trivia quiz on Christopher Columbus but it got too depressing. I couldn’t find one good thing to say about the guy…other than he was brave enough (or greedy enough) to face quite a bit of uncertainty to sail to an “unknown world” to try to get rich. 1. He wasn’t even the first gringo to sail to the Americas. Norwegian Leif Ericson did it about 500 years before. Lief landed in Newfoundland, Canada. 2. 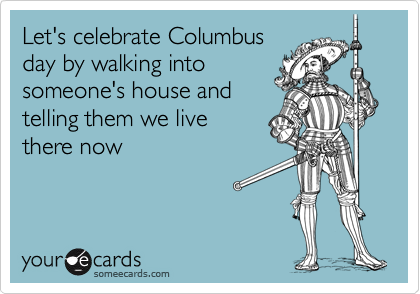 Senor Columbus and those who followed brought diseases & slavery which ultimately wiped out 90% of the native population. 3. He may have been an opium addict and probably died of syphilis. 4. He didn’t seem to be a very nice guy at all. And according to the paintings of him (painted after his death, granted), he was no looker. Let’s just say that no teenage girls in the 1500s had a poster of this guy on their wall. (I would have gone with Michalangelo’s “David” myself). Let me try to think of one thing positive. He was probably from Genoa, Italy and that’s a beautiful place that makes exquisite salami. Oh! I thought of another one. He didn’t actually invent slavery…though reading many of the articles about him, it sure seems like he did. So…the idea of a Pan-American Day (rather than Columbus Day) is a great one. Belize has incredible ethnic diversity from Mayans still speaking the Mayan dialects as their primary language to Garifuna people speaking their language to Mennonites to Lebanese-Belizeans. I could go on. Today’s a great day to focus on how far we’ve come, how much we can do to appreciate and respect all cultures and how much farther we have to go to better understand each other. So I’ll just leave you with some pictures that I took first thing this morning. It’s going to be a beautiful day. Even Columbus himself must have been impressed with Central America when he sailed along the coast on his 4th and last voyage from 1502-1504. Answer: Juan Ponce de Leon. In 1513, landed for the first time in Florida. He’s the guy always associated with the Fountain of Youth. I understand he was born “Columbo” and changes his last name to “Columbus” to be more fashionable. Thanks for the info…history is always more interesting told like this. Thing is that at the time this all went down it was about building empires by Western European royalty. 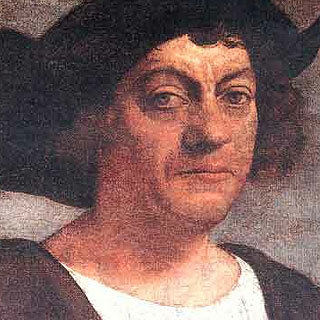 Columbus was Italian. King Ferdinand and Queen Isabella of Spain financed the voyage and had the intent to convert whoever lived where they made landfall to Catholicism to beat out Islam. Look at where we are now in the world.